Who are new leaders of post-revolutionary Kyrgyzstan? Who will take over key position in the government? Who is going to manage the marginalized population? Are the power transfer procedures going to be legitimate? Who will represent the republic in the international community? Today, everyone is concerned with these questions. We are not giving certain answers. Our Bishkek-based correspondent provided the portrait sketch of new government and general situation in Kyrgyzstan. Bakiev’s personal security is the price of order? 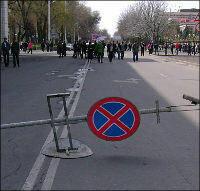 In the first two days of revolution the aggressive masses were staying in Bishkek. They became the source of problems for the city dwellers and new government that is obviously not able to ensure normal functioning of the municipal structures yet. Some protesters were staying in the central square of Bishkek as if they were demonstrating their hatred to Kurmanbek Bakiev and did not want him to come back. Meanwhile, in Jalal-Abad, the native town of Kurmanbek Bakiev, his supporters gathered for the meeting, where they demanded security blanket for the former president. On the other hand, there were also enough people that were protesting against Bakiev’s clan. The former opposition leaders do not rush to make quick decisions since Bakiev’s personal security does not guarantee the stability in the capital city. There are still many people in the republic, not representing former opposition forces but suppressed by Bakiev’s clan in the past. Who will guarantee these people will not want to revenge? The revolution leaders realize that they need to punish someone from the former regime in order to justify their statements about draconian nature of Bakiev’s rule. After March revolution of 2005 not a single member of Akaev’s team was brought to trial; this produced the image of full impunity for the top officials. In his live interview at National Television Azimbek Beknazarov, supervising the legal system and prosecutor’s office, said that president’s brother Janysh Bakiev was put on the wanted list. It is obvious the responsibility for the massacre will be put on Bakiev’s team and nobody can guarantee the personal security for the team members. According to Ferghana.Ru sources, the disorders in Bishkek are well organized by criminal structures that expect cooperation proposals from the new government. If the government wants to cooperate with criminal leaders, they will stop provoking the crowd to take the governmental buildings by storm. On the other hand, the criminal groups, which cooperated with former regime, are interested in the destabilization in Bishkek. If, for some reason, Bakiev comes back to power they will have more arguments to lobby higher benefits. One of the main challenges for the new government is legitimization. According to the current constitution, if the president is not able to perform functions the chairman of the parliament takes over presidential functions and announces new presidential elections. However, the current chairman of the parliament Zainiddin Kurmanov was in Saint-Petersburg on business and has not returned home yet. If the chairman of the parliament is not available the current Prime-Minister becomes the acting President, but Daniyar Usenov resigned on April 7. It has to be mentioned that the amendments in the constitution, proposed by Bakiev and legitimizing the power transfer to the person, selected by Presidential council, have not gone through all three parliamentary readings and, therefore, have not been put in effect. Today, Kyrgyzstan is in legal collapse when current legislation cannot legitimize newly established government while old mechanisms do not function. At the same time, Almazbek Atambaev said strange things in Moscow: "We decided to establish the parliamentary republic when there is no single dictator. We are not going to run parliamentary and presidential elections until we amend the Constitution". The parliamentary deputies are gone, the president enjoys home in the village of Markay, but Roza Otunbaeva says "he still can leave the country". The provisional government guarantees personal security of Kurmanbek Bakiev if he resigns voluntarily. However, Bakiev is not going to do so and nobody is negotiating him. If Atambaev says there will be new Constitution, but no new parliamentary elections, this produces doubts. Who will discuss and adopt this Constitution? Who can guarantee its legitimacy? So far Atambaev’s option looks strange. It feels like the group of revolution leaders will draft "fair" Constitution, considering their interests, and will adopt it. On the other side, Omurbek Tekebaev has extensive experience in the development of Constitutional mechanisms and he certainly has some good ideas that will legitimize current situation. Historically, the acting president becomes the new leader of the state. Roza Otunbaeva, the head of the interim government, has substantial advantage: in 6 months people will get used to her as a leader. She can earn some good points if her team manages the current situation and produces good results in the next few months. It is clear that there are two real candidates: Roza Otunbaeva and Omurbek Tekebaev. On the other hand, new "parliamentary vector" assumes that president will lose much of his power while the Prime-Minister becomes the key figure. Roza Otunbaeva is attractive "project" for international community. If a woman becomes the leader of conservative, patriarchal society, surrounded by Asian dictatorships, this will be an astonishing precedent. Roza Otunbaeva, fluent in English, used to be the Foreign Minister of Kyrgyzstan. She is progressive, wise and charismatic person. Otunbaeva does not have too many relatives and this can become the decisive argument in today’s Kyrgyzstan, irritated by the family rule of Bakiev. Besides, Otunbaeva can help getting the loans and funds from international financial institutions and donors: she is more trustworthy leader than any other local politician. She is honest and incorruptible; otherwise, the Bakiev’s regime would bring her to trial as it was done against former Foreign Minister Alikbek Djekshenkulov. However, honesty and incorruptibility are also key characteristics of Omurbek Tekebaev. There are some challenges for Otunbaeva though. She is not fluent in Kyrgyz, very important factor for people, living in the rural areas and ethnic Kyrgyz in general. Besides, traditionally conservative Kyrgyz society does not trust women much. Emancipated and progressive Roza Otunbaeva scares the electorate in the regions of Kyrgyzstan. Omurbek Tekebaev is sometimes referred as "age-long presidential candidate". Allegedly, he won the presidential elections in 2000 but the results were falsified to the benefit of Askar Akaev. There is no doubt that Tekebaev is one of the most charismatic opposition leaders and competent lawyer that knows all Codes in Kyrgyzstan. Tekebaev, as the presidential candidate, seems to have better positions among the local electorate. He is fluent in Kyrgyz, but not as fluent in Russian. When he was resigning from the position of the Parliament’s Chairman under the pressure of Kurmanbek Bakiev, he said "In the future we will be proud of our country".